Something happened, though, as Christians began to investigate God's world. They started to discover more and more things in nature they had assumed were a result of a divine agency were really responding to laws of nature and biology and by altering the circumstances or the variables they could change the outcome of those processes. At the same time, they made great advancements in mathematics and they reawakened to the philosophy of Plato and the Greeks, which emphasized logic being the ultimate guiding force of knowledge. All truth can be discovered through reason and analysis. God may exist, but man does not need God to discover truths about himself or the world. Moral values are found by thinking about them carefully. Because so many achievements were coming from men thinking hard about their world, philosophers began to conclude that the ability to reason was all they needed in order to know everything there is to know about the world. Many believed God existed, but they felt that God's revelation was unnecessary for discovering truth. They assumed that given enough time and thought, man would figure it all out on his own. God was removed from being the primary source of truth as people became convinced that they were smart enough to discover anything with enough thought and analysis. Naturalism: "God Doesn't Count as Knowledge"
The removal of God as the primary source of truth was a huge shift in thinking for the world. If all people need to discover truth is to identify facts and reason through them with a good mind, then focusing on nature becomes more important and focusing on God less so. Thus the Grand Story in western society shifted from God to Nature itself, just as Romans 1:25 warned. Therefore, since God wasn't needed to understand the ways of the world, many educated people took the next step and denied Him altogether. If God doesn't offer any explanations to the ways of the world, why assume one needs to worry about Him? The worldview adopted by those who think this way is called "naturalism". The world is seen in purely mechanistic terms: this causes that just because the laws of the universe work that way. Belief in God inhibits the discovery of knowledge. Science should inform our decisions as the highest form of knowledge. Moral values will change as man evolves. Naturalists, because of their worldview, now seek to explain everything without pointing to God at all. Even in big issues, such as the origin of life on the earth, God cannot be accepted as a cause, because it violates their notion of "really" explaining things. Therefore, Darwinian evolution becomes the capstone in the search for a purely mechanistic way to explain how the diversity of life arose on the planet. In fact, to say "God did it" is seen as a cheat; naturalists would object to anyone claiming the involvement of a divine being saying the person hasn't thought hard enough about the problem. They define knowledge of God as false knowledge. You can see how important it is to understand worldviews! Since naturalists are committed to not accepting explanations that involve God, their minds are closed to the existence of God before you even give evidence. The bias of naturalism is plainly seen everywhere today, even in popular culture. Gene Roddenberry, the creator of Star Trek, held to this view, and one of Star Trek's recurring themes is the evolution of man to his betterment.2 No religious belief system is ever in view for the show's protagonists. Roddenberry believed reason alone would catapult mankind into this new utopia and his popular franchise has continued to preach his message ever since. RE: "Naturalists, because of their worldview, now seek to explain everything without pointing to God at all." Imagine if God were allowed in science- then science would be reduced to religious bickering between Hindu's, Christians, Muslims, Native Americans, New Agers, etc. As it is, science aims to be objective, and any reasonable person from any religion can participate. Lenny, do you still deny macroevolution, or accept it like evangelical Christian scientist Francis Collins? “Theism is based on faith, atheism on reason & evidence.". Atheists if theyre sincere, assume on blind faith that scientism & materialism (aka mindless matter) are the only game in town; But beliefs don’t change the facts. If one is rational, facts should change beliefs. The existence of metaphysical truths like abstract logic, maths & scientific laws weren’t invented by a physical brain, they were discovered. Being non-contingent & immaterial, their existences cant possibly be the product of mere brain chemistry. 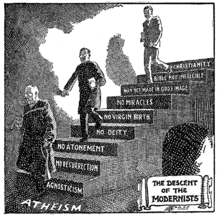 Nothing summaries the atheists meaningless worldview & vain attempt to prove he's nothing more than future worm fodder, than the statement by philosopher Jean Paul Sartre: “That God does not exist, I cannot deny, That my whole being cries out for God I cannot forget.” Sartre also lamented "Every existing thing is born without reason, prolongs itself out of weakness & dies by chance." So why is a soul-less bag of chemicals in motion (Russell's term) so obsessed with trying to deny a an ultimate source of intelligence for a universe that exudes rational intelligibility?